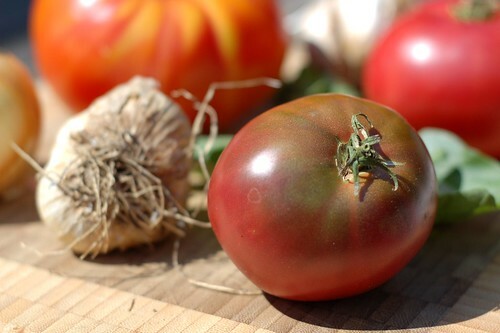 Last summer, the late blight destroyed the vast majority of east coast tomato crops but this year, there are fat, flavorful tomatoes hanging from vines everywhere ya look. In fact, this one was hanging off the vine in a pot in our little container garden just a few days ago. It's an Ulster Germaid grown from seeds I bought from our very own Hudson Valley Seed Library this spring. I used a mix of heirloom tomatoes from our CSA, Hearty Roots Community Farm, and plum tomatoes from Hardeman's farmstand just down the road from them in Red Hook. I kept the additions simple - sautéed onions and garlic, fresh basil, sea salt, freshly ground pepper and a little red wine. Although there's considerable prep time involved, the process is quite simple -- just blanch, peel, chop, sautée, simmer, sterilize, and can! It takes a little while but there's something very satisfying about pulling the skins off those delicious red 'maters. I am a relative canning novice but I have canned tomato sauce in this manner in the past without killing anyone so I'm just going to cross my fingers and hope for the best. But YOU should add the lemon juice or citric acid to the jars or use a pressure canner since that will allow you to get the sauce hot enough to actually kill any botulin. Remember that important adage (adored by parents the world over): "Do as I say, not as I do." Here's the recipe. 1. Bring a large stockpot of water to a boil. Immerse the tomatoes (you'll most likely have to do this in batches unless you've got a really really big pot!) in the boiling water for 30 to 60 seconds or until the skins begin to split. Then dip in a large bowl of cold water (ice water is best) and slip off the skins. 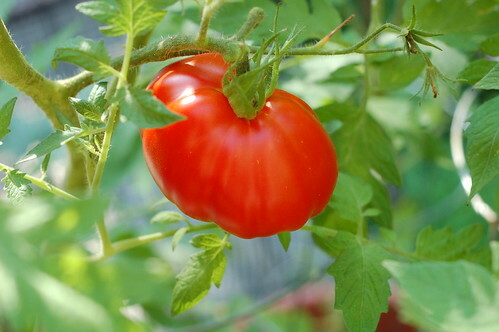 Core the tomatoes and remove any blemished or discolored parts. Chop roughly and set aside. 3. 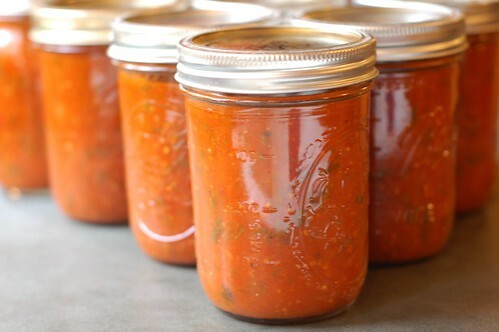 When the sauce is beginning to look like it's approaching the right consistency, fill your canning pot with water and put it on high heat. 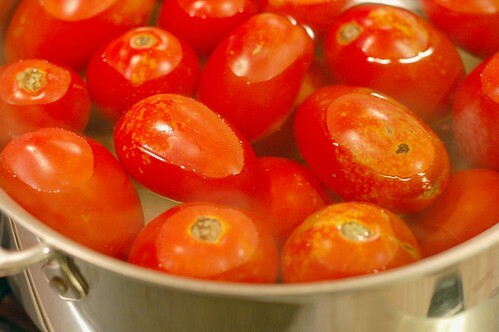 Once the water has reached a boil, place your jars and lids in the water and boil them for 10 minutes to sterilize them. Or, if you don't have a canner or don't want to deal with all this hootenany, you can also just freeze the sauce in batches. Just let it cool down fully before you put it in whatever containers you plan to freeze it in! We often use yogurt containers. 4. To be safe, add 1/4 teaspoon of citric acid or 1 tablespoon of lemon juice to each pint (double those amounts for quarts). 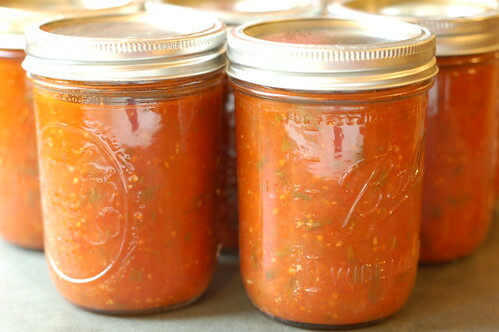 Then ladle the bubbling hot sauce into the hot, sterilized jars, leaving 1/2-inch head space. Remove any air bubbles. Wipe the rims and screw threads with a clean, damp paper towel, apply the two piece metal canning lids, and tighten the screw bands. 5. Process the jars as follows (unless you live at high altitude in which case you should check the UGA's site for recommended processing times.) If you have access to a pressure canner, please use it - it's definitely safer than the hot water bath one! Using either 11 pounds pressure with a dial gauge pressure canner or 10 pounds pressure with a weighted gauge pressure canner. 6. After processing, remove the jars immediately, and place on a rack to cool. You should begin to hear a delightful "pop" "pop" "pop" sound of the jar lids sealing. Any jars whose lids do not pop down should be placed in the fridge and used within one week. It looks delicious.... and alot of work! My hubby is of Italian descent; but I have his endorsement for my Spaghetti sauce. He adores the Hot Italian Sausage sauce that I make. I cheat and start with a can of sauce, then add... whatever. It sounds alot like yours. The bit of wine is essential. and a glass to go with it. I refuse to make spaghetti unless I have 3 hours to simmer the sauce into perfection. 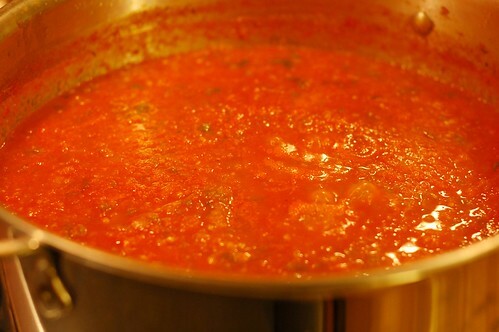 If I could get a good harvest, I might get brave and try making sauce too... with a pressure canner. I think I'd keep your sauce in the refrigerator or freezer 'just in case'. It's probably fine; but you never know. Some of the local church ladies make up a huge batch of spaghetti sauce each year and freeze it. That goes back 50 years of Italian tradition in S. CA. sounds very tasty, SJ! I often do the same thing when I want to add meat. And I think freezing is a very underrated method of preserving things. 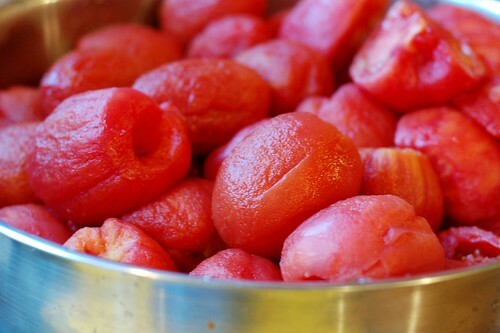 I'm pondering making these delicious-looking slow oven roasted tomatoes with any more tomatoes that come my way and will then scoop them into freezer bags and toss them in the chest freezer to add to things all year long! I've never tried oven roasting the tomatoes. It sounds incredible. In the past, most of my surplus garden went to friends and family. Here in S. CA we can grow things most of the year; so it seemed a bit of a hassle to can too many things. I did more this year because I was letting the land rest... and was bored. So, I planted fruit trees, experimented more with canning, and found some other things to keep me busy. The next canning project for me will be pomegranite jelly. It's the time of year to harvest here. Then I like to age it. ;P I complement you on your new adventures in canning. 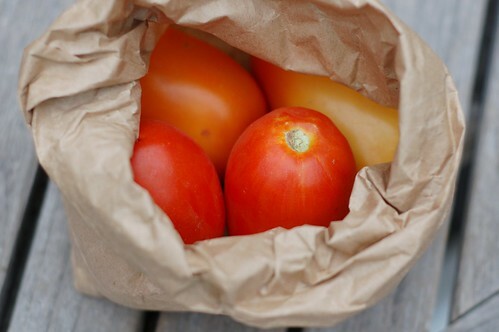 Did you really get 8 pints from 20 lbs of tomatoes? We got 5! Maybe it's because we seeded them (well, cheated, and ran them through the KitchenAid grinder). Hey LT, yes, we did! I am sure the seeding accounts for some of the difference though I think yields can also vary a lot depending on both the type of tomatoes you use and how much you let the sauce reduce.